The area of Vienna airport is larger than 320 football pitches and it is located 18 kilometres east from the centre of the Austrian metropolis. The airport that is one of the busiest airports in Europe has been connected to motorway network since 1982. Also thanks to this possibility our limousines are able to secure for you not only luxury but also quick transfer from Bratislava or from Vienna airport. The largest Austrian airport started to write its history in the services of the army during World War II. Since 1954 the airport has the status of the main air transport hub in Austria but it had to wait until 1972 for its second runway. Today it has a huge air port with four terminals, 20 thousand employees who are able to handle more than 22 million passengers in the course of the year. In the course of the decades of its operation in civil transportation Vienna airport in the vicinity of the town of Schwechat became the symbol of expansion. Extension of the whole area, of the length of the runways, of the number of terminals, office or business premises as well as the number of airlines that operate here, all this led to the current significant status of the airport that currently sees off passengers to nearly 290 destinations worldwide. Former Pope John Paul II or the sport teams participating in Winter Olympic Games in 1964 and 1976 belong undoubtedly among the most prominent passengers who have ever landed here. Even though the reputation of Vienna airport terminals is not as reputation of the most beautiful buildings would be, the airport control tower that was opened in 2006 received a great number of various architectonic prizes. With its height of 109 metres it is the tallest building of its kind in Europe and it offers a view to the whole area of the airport. As of the 1st of July 2016 it will be possible to observe from it regularly the landing manoeuvre of the giant Airbus A 380 of Emirates. After various complications caused by rather high costs Terminal 3 was opened in 2012. Thanks to this event the annual capacity of the airport increased to 30 million passengers. You will find impressive numbers also among the data concerning the area of the office premises for rent. Currently a total of 60 thousand square meters are available. VIP passengers of regular and private flights are handled in the western part of Vienna airport. With the Business & Privat Jets service a flight to any chosen destination according to the flight schedule set by you will be arranged for you. This service is appreciated by passengers travelling to destinations which are not accessible by conventional airlines or which would require multiple changes of planes. 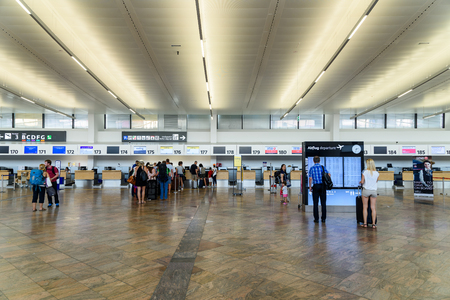 Transporting passengers and handling approximately 50 thousand pieces of luggage daily are only a small percentage of services which you can rely on at Vienna airport. Comfortable saloons offering relax before your flight, children corners, numerous restaurants, accommodation facilities, shopping area, medical and dental service and even some chapels are at the passengers ‘disposal. Thanks to the above mentioned connection to the motorway network Vienna airport has excellent access even if you start your journey from Bratislava and its surroundings. We will take you to Vienna airport from the capital city of Slovakia within three quarters of an hour using the A6 and A4 motorways. That is, of course, valid also if you travel the opposite direction. Everything with maximum comfort of a luxury limousine with professional and informed driver who will always take you to the right place in time.